The C69xx series control cabinet PCs from BECKHOFF Automation feature a compact construction with robust aluminium housing. The C69xx industrial PCs feature up to three independent Ethernet interfaces, making them ideal for use as compact CPUs in EtherCAT control systems. The C6920 and C6930 control cabinet PCs in the same series are now available with plug-in card extensions for applications that require additional PCI or PCIe cards. This feature allows the PC to increase its flexibility while retaining the compactness. Beckhoff C6920 and C6930 control cabinet PCs are optionally extendable using two plug-in card slots and can accept conventional PC plug-in cards of up to 190mm in length. The 70mm wider PC housing includes a backplane that provides a choice of two PCI slots, two PCI Express slots or one PCI and one PCI Express slot. The industrial PCs feature plug-in card connections on the top side while an aluminium cover on the front of the slot expansion permits easy installation of the plug-in cards without having to open the housing. All Beckhoff PCI fieldbus cards can be used in the C69xx series. The plug-in card extension can be ordered as an option. The C69xx industrial PC series is equipped with a 3½-inch Beckhoff motherboard while the C6920/C6930 models feature powerful Intel Core2 Duo processors. The C6930 additionally has a SATA RAID controller for mirroring two hard disks. 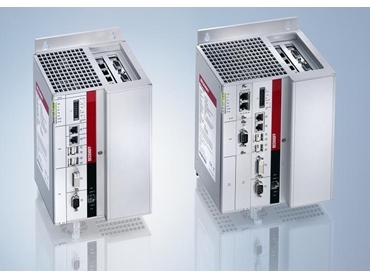 Extensions via additional PCI or PCIe plug-in card slots are also possible for the Beckhoff panel PCs from the CP62xx series and for the C6525 built-in industrial PCs.